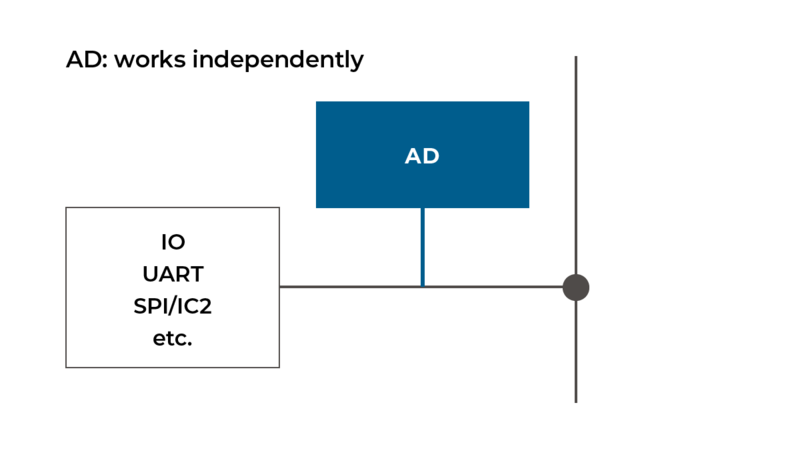 AD reads analog voltage applied on each io. ad0(on io0) to ad11 are available. Only the voltage change will be notified. All 12ch ad can be used. It will not affect the sampling rate. ad also monitors vdd of obniz itself(normally 5v). Each ad result will be calibrated. And ad accuracy is 10bit. Calibration method is depend on firmware version. ad converter is independent. It also works while IO is used for another function. This starts measuring voltage on ioX until end() is called. Callback function is called when voltage gets changed. You can start without the callback function. The callback function can be set at anytime. Get the voltage value without callback. The value will be stored in the value variable. Note: This property stores the last received value. NOT the value when you read this property. This measures the voltage just once and returns its value. This function will pause until ad result arrives to your js. This stops measuring voltage on ioX. Callback function can be set after start.